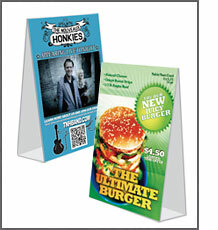 Table Tent marketing is an excellent way to upsell products, promote services and instantly boost sales. Whether it is for special promotions, restaurant menus, or informational purposes, custom table tents are an easy way of advertising directly to your customers. Printed in full color with a full bleed. Scoring and Die Cutting using an L-Lock system, so tents stand up on their own, are included. Once the artwork is approved . . .
•LOWER COST Once the artwork is approved . . .
Additional Options: Rounded corners are available for an additional charge per corner. Business card slits are available for an additional charge per set. Shipping Product ships flat. Extremely simple to assemble! The inside of the tent card when assembled is white. Rush In a rush? Same day turnaround is available for Option Two. Call to check production availability and pricing.